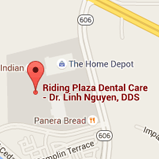 Serving South Riding, Chantilly, and Aldie, VA (Virginia) - Dr. Linh Nguyen is your family dentist, offering exceptional dental care for children, teens, and adults. Riding Plaza Dental Care is your neighborhood dental practice, serving local families with high quality care in a warm and friendly atmosphere. Dr. Linh Nguyen and her talented team take the time to get to know each patient and build a trusting relationship. Dr. Nguyen offers a wide range of dental treatments, including checkups, teeth cleanings, periodontal maintenance, fillings, crowns and bridges, veneers, dentures, implants, root canals, and extractions. Contact our South Riding office to schedule an appointment. We work hard to ensure that every patient has a pleasant experience at each visit. Our staff never rush through appointments, as our policy is to build in additional time for patient education. Because our practice is comprised of a single practitioner, our patients get undivided attention from the doctor each and every visit.